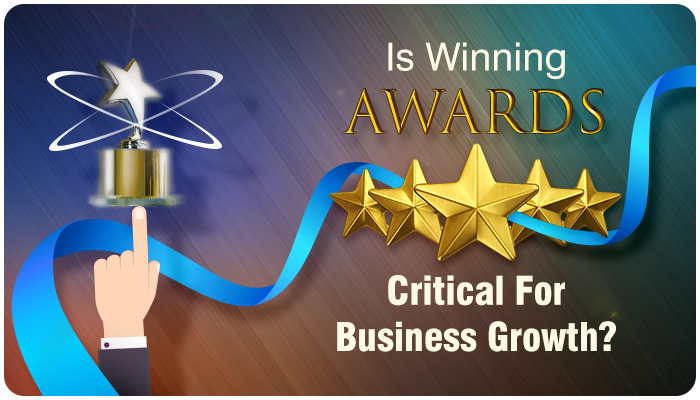 Blogs eventaa- Is winning awards critical for business growth? Home Blogs & Article Hindi Is winning awards critical for business growth? A glamorous award function is staged to honour you and few others who have done good work in their respective field. They awarded you with an artistic sculpture to felicitate your achievements, and for a while, you felt like royal reigns under your feet. The accolade does not actually reflect your competency in any respect. But still it’s a proud moment for you, and like others, you followed the pattern. Next year more people hurled on stage with more accolades and more handshakes but during this period the bubble around your accolade bursts. You realized that your business does not stand out on this accolade and it seems trivial. This post is not intended to make you feel desist on your achievements but to accomplish or serve the purpose of growing your business on a larger scale as well as acknowledging people associated with it. This post is also intended keeping in mind that no award can justify any work in the true spirit because every work has different parameters. So, how can an award do justice for two different works which is done under different parameters and different circumstances which are being nominated or compared! The fundamentals itself are wrong. So it’s not just about the creditability of awards (which is also an issue in the case of some awards), but it’s a question of judging work on the equal ground, which is impossible for any awarding organization to provide. Have any clients asked you that we will give you a brief or award a work only if you have won awards in the past? Has any purchase officer told you that we would give you higher cost if you have won awards? So the value of awards is only to ego massage yourself, your clients and employees, in turn, show off to their bosses. That’s the real value. But when we are talking about business growth, it all boil downs to the competition of ideas, creativity, cost, experiences and bandwidth of operations, resources, etc. Hence, participating in a race to win awards is just like climbing uphill that does not have a peak. Do not remain in exile despite of your marvellous work. Circulate your work to maximum people related to your industry. Not necessarily to your clients only. Reaching out to them and create a bonding with the same group which can skyrocket your business. Enlist a group of your secret admirer because they are your trump card. Without your knowledge, they refer you or your services to their personal groups. They are capable of bringing referrals to your work quickly and propel up your success ratio. It is a core element of your business growth and brings a true reward to your work in a real sense. Consumers envisage “feedback” as to give insight on product service or quality received from you, but ultimately it brings recognition to your work. With a technology-laden business architecture, it is easy to reach your audience and seek for “Reviews and Ratings” on an industry portal. The more you are reviewed and rated, the more you can fetch work from the market. All great companies are good at marketing. There are 50 shades of marketing on social media, you have to figure it out which one will strike you as a business deal. Unlike old techniques, where service providers manually reach out to clients and vice versa to promote their services, online platform can be a viable solution. Loyal consumers are guaranteed revenues for the business. If you don’t have a business model that entice recurring business, then you are at risk of being left behind. Enrolling client to “newsletter subscription” is one way of doing it. Automatically renewed subscription are more preferable than periodic renewal. Besides subscription other factors that attracts recurring business include maintenance contracts, monthly support agreements, contract renewals, etc. For any business, stability is a major factor, and this is very much related to employee’s attrition rate. Most of the time employees contribute towards company success, but seldom company thinks about employee’s success. If a company develops a good working place for employees, it automatically circumvents the attrition rate. Design a business model that rewards employees work besides monetary allowance – for instance, create an employee’s achievement pin board - that is shared among the fraternity, build an employee forum, where they give their ideas, provide the opportunity for career and personal growth training and education. Ultimately, winning awards can never deliver business growth; it is the result of various aspects of business forces working together that counts.